Kayla is a darling little mama-to-be who is both a stylist and artist. And she is very, very pregnant. 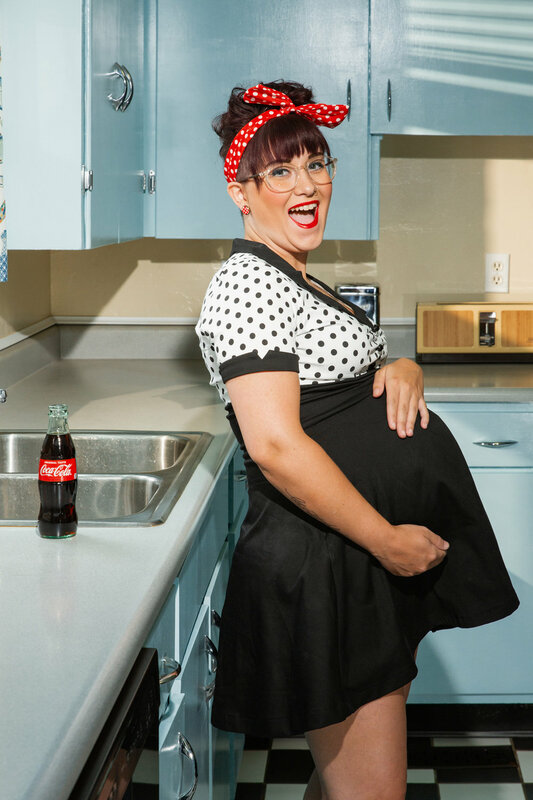 She came to me about a maternity session but she had an idea about it: she loved rockabilly and she loved a pinup style. And she wanted to involve Shea, the father-to-be. We met and talked about ideas and as luck would have it, she has a friend with a home in South Knox that has a vintage style kitchen. What we decided would be a scene of 50’s-style domesticity, with Kayla giving Shea a haircut and shave at home. So, we had our style, we had out set. I had some fun since the shoot day dawned cloudy and overcast, but I wanted morning sun streaming through the kitchen window. If the sun won’t cooperate, fine - I’ll just make my own with a gelled light. And if you’re wondering, the color of the kitchen cabinets will tell you - it’s a boy! Kayla did not want the usual portrait you see for maternity, the mother in a long, flowing dress in an idyllic woodland setting. There is nothing wrong with that, if that is what you like. As a photographer, for portrait sessions, and especially for a conceptual portrait like this, I prefer to collaborate with my client and we get an idea of what we are working towards for their images. Sometimes, heading off to a park for “just a photo shoot” works when what a person wants is more casual - taking the time for planning and execution mean mores effort but the result is unique the client. And thanks to Shannon for the loan of her cool kitchen!